It’s getting hotter outside and we’re looking to eat healthier. And as our work days get busier, we’re finding less and less time to cook during the week. A hot Sunday afternoon is a good excuse to stay in the AC and cook . . . and cook . . . and cook. Even though it’s hot out, this stew sounded too perfect to pass up – plus we made some additions with sweet potato and brown rice. Give this simple stew a shot – even on a hot day. In a medium stockpot, over medium heat, add the oil, onion, bell pepper, and jalapeno. Cook until softened, about 5 minutes. Add the garlic and cook for approximately 1 minute. While stirring constantly, add the curry and saute for 30 seconds. Add the broth, chickpeas, tomatoes, sweet potato, salt, and black pepper; bring to a boil over high heat. Reduce the heat and simmer gently, covered, stirring occasionally, about 20 minutes. Add the rice and stir until heated through, about 5 minutes. Stir through the chopped parsley and serve warm. 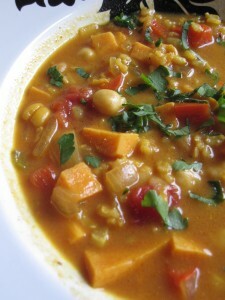 Adapted from The Tropical Vegan Kitchen by Donna Klein; available at http://www.epicurious.com/recipes/food/views/African-Curried-Coconut-Soup-with-Chickpeas-352349.